This guide will attempt to organize everything someone living in the Regina area might want to know about flying out of U.S. airports. If you see anything in this guide that looks incorrect, out of date, or could just simply be improved with better info, please don't hesitate to contact me and I'll fix / update it. How long of a drive is it? Don't forget to account for border-crossing times in each direction. You can find estimated wait times online. Are there good deals to be had? Typically, the best deals out of Minot are found on the two low-cost carriers that fly out of MOT, which are Allegiant Air and Frontier Airlines. Minot airport also has flights on Delta, and United. The most likely reason someone from Regina would want to make the trek down to Minot to fly somewhere is to get to Las Vegas for a lower price than out of YQR. Typically this would be using Allegiant Air. The only other destination that Allegiant flys to from Regina is Phoenix. Frontier Airlines also offers flights to a variety of U.S. cities, usually via their hub in Denver. 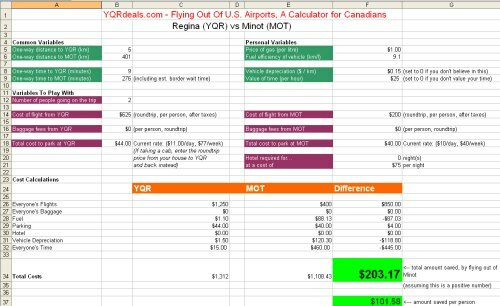 Internationally, deals out of Minot are less likely to be much cheaper, or can involve routes that are at least as complicated or lengthy as flying out of YQR. It's a smaller airport, and it's biggest strength is usually flights within the U.S. It doesn't hurt to check international flights though, as Delta or United can sometimes have flights that are significantly cheaper than flying out of Regina. Also, when comparing costs, be aware that Allegiant charges extra for absolutely everything, including even carry-on luggage now. How much would I have to save for it to be worth the drive? Go to the YQR vs MOT worksheet and enter in a few variables to calculate what your true savings would be. Using common averages, I've found that if the flight from Minot is about $325/person less than the flight from Regina, the average person is only breaking even. In my opinion, when the flight from Minot is at least $425 less per person than the flight from Regina, it becomes worth the drive. This is based on my calculations using average factors, and 2 people in a vehicle. You can see the example in the spreadsheet that was used to draw this conclusion. Parking is currently $10/day, or $40/week, according to the Minot Airport website. Is there any public transportation from Regina to Minot airport? There are no great options unfortunately. regina, yqr, delta, minot, mot, united, guides, allegiant air and frontier airlines. 3 Responses to "The Official Guide For Canadians Flying Out Of U.S. Airports (from Regina & area)"
I have flown out of Minot a couple times instead of Regina typically for two reasons. 2) Routes seem to be more direct and do not involve an over night stay in either Calgary or Edmonton like many of the flights on Westjet via the USA and I refuse to fly Air Canada. I feel like you could factor in cheap alcohol and tobacco in the states. It is far easier to transport that over the border in a car rather than a plane. This may not be a factor for some people but it could contribute cost savings if you are going to buy these items anyway. I agree with the other posters. I have flown to Phoenix and Vegas out of Minot many times. It's easier to clear customs in the car, and shopping for liquor, groceries, etc is a bonus.